With dark clouds thundering and pouring down, you're relieved to know that the monsoons have finally arrived. But with the much awaited monsoons also come bad traffic, water logging, mucky shoes and more. 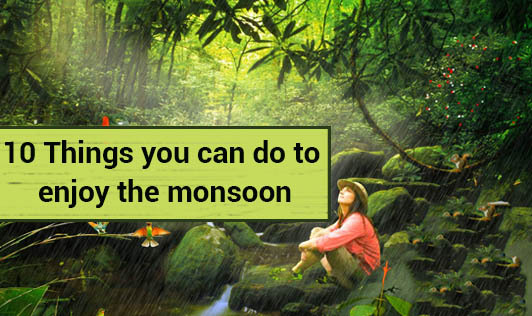 That's why we have for you a list of fun things you can do to beat your monsoon blues. Get drenched in the rain- Relive your childhood days. Ditch that umbrella and just jump and splash around into the puddles. Take a walk by the sea- Those who live by the sea or are just a short drive away from the sea can just take a long walk by the sea. Ooh..!! Don't miss the hot roasted corn while you do so. Play football- So what if you come home all mucked up? Trust me, it's the best thing you can do. All you need to do is wear an old T - shirt, call your friends and you are all set to play! Plan a romantic drive- Switch off your mobile phone and go on a long drive with your partner. P.S: Drive safely and don't forget the cup of chai on the way! Go on a trek- Monsoon is the best time to get in touch with nature, so all the adventure lovers out there, pack your bags and get set! Plan a slumber party- Plan a slumber party with your close friends. Order some healthy food and stay up late. Watch the rain and relax! Try your hands at cooking- Test your cooking skills and discover your forte. It is a great way to spend a rainy day. Play board games- This classic option never goes out of style. Plan a board game with your family along with some healthy finger foods. Bubble bath therapy- Totally soaked in the cold rain? Treat yourself with a hot bubble bath. Movie time- Stuck indoors? Get your stock of favorite movies out and just snuggle in front of your television. If everything fails, then you can always sing your favorite song and feel better!